As expected, Lauderdale Yacht Club delivers a sensational Atlantic Coast Champs (and Lauderdale Olympic Classes Regatta) this past weekend! How about those reaches on the trap on Sunday? Perfect angle to full-on plane! How about the Sunday runs? Just send it! Great Lauderdale conditions. 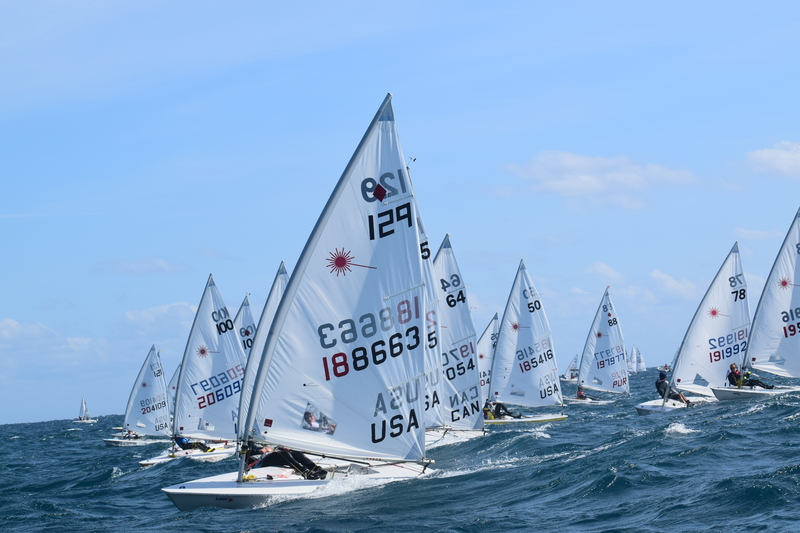 The final day of the 2018 LOCR Regatta (also Laser ACCs and Youth Worlds Qualifier #1) began with plenty of buzz about the expected conditions of 30 knots and seven foot seas rolling in from the north. Many sailors made the decision to stay ashore and not brave the large swell Lauderdale is known for. Most of the Finn Class decided to head back to Miami to continue training (and well get some rest) in preparation for the Miami World Cup. The day began with a fizzle as the light-er conditions from Sunday held over for the first race. In preparation for the tuned up breeze the R/C set up a windward/leeward course with five…yes five….long legs south of Port Everglades Inlet with an upwind finish so the racers wouldn’t have a long upwind slog to get home. 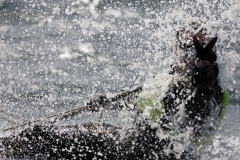 It ended up being an hour and a half race of attrition that tested the sailors’ meddle. Hey, if you sail Lasers, be happy with pain! Since the conditions were still very sailable, the R/C went for a second race, and sure enough, the breeze slammed north and started cranking just in time for the sailors to really start feeling the effects of the 1.5 hour race one. Finally the forecast bore it’s head and made for some exciting conditions. In the end, LYC’s Chase Carraway was able to hold a 13-point lead over the 93 boat Laser Radial fleet to take home 1st in Radial and top Junior! He was followed by two Olympic campaigners, Pernell Michon from France in second and Sarah Douglas from Canada rounding out the top three. 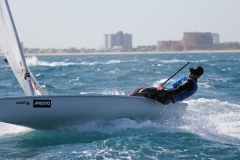 Robert Davis had a Canadian bear hug grip on the Laser fleet until Juan Maegli found pay dirt with a 1-2 on Monday, which vaulted him in top position. Davis held on for second with a tough day and Ernique Arathoon was the last spot on the podium. Emma Shakespeare squeaked out a two-point win in the 4.7, followed by Spencer Lehman and Jose Arturo Diaz. ← YOU! Great pic of YOU! Pics of D13 Champs, Gonna Be One Of YOU!